You are here: Home / Ethnic Groups / The People of Kalimantan / Who are the Berau? The Berau live in many small villages in the Berau regency of East Kalimantan. 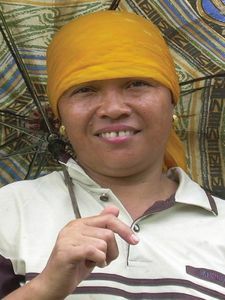 The Berau speak their own language, which separates them from other ethnic groups in East Kalimantan. The Berau mainly make their living as either farmers or fishermen. The farmers grow sweet potatoes, cassava, lentils, fruits, and vegetables. Like other Kalimantan ethnic groups, the Berau practice migratory agriculture because they cannot maintain the soil’s fertility. New farmland is made by cutting down trees and burning the underbrush. The initial clearing of a field is accomplished with the help of a large group of neighbors. Some Berau living in cities work for the government or private businesses. Others work as craftsmen or day laborers. The Berau also produce a specially woven fabric, which they often sell to outsiders. A new form of income that has developed recently is presenting their traditional ceremonies as a tourist attraction. Most of the Berau follow the patrilineal kinship system (tracing descent from the father). Male dominance is seen in every aspect of life. The men determine issues concerning marriage and inheritance. In the past, the Berau had class distinctions but these have faded in modern times. Today, wealth and formal education determine one’s social status. The richer a person is or the higher a person’s formal education, the higher their social standing. In general, the Berau prefer to live in groups near rivers in wooden raised platform houses. Their houses are close together, like in the city, even though there is plenty of land where they live. They have a clear separation between living areas and fields. Today most Berau identify themselves as Muslims. However, many Berau people still believe in animism. They believe that spirits are in all places and influence mankind. Thus, traditional Berau rituals and ceremonies focus on seeking protection through magic by either appeasing or controlling both good and bad spirits. A shaman plays an important role in Berau society. He is often asked to use spells to heal sicknesses or initiate other favorable results in people’s lives. Since the Berau are nomadic, most of them do not have opportunities for formal education. Typically, only those who are settled receive a formal education. The areas where the Berau live are rich in mining resources, such as gold, coal, lead, zinc, petroleum, and natural gas. These areas also have forestry products like rattan, resin, and wood. Unfortunately, the abundant natural resources have not been managed well, so they do not give the Berau a better life. Better management efforts are needed to improve their human resources and help them become self-sufficient.